It’s pretty obvious that most of us would love getting our makeup for free. I mean, if we have to, right? I guess I won’t complain. 😉 For those newbies among us, the only question that remains is how to go about getting them. First off, you need to know that beauty freebies are much easier to find than you might think. Quite a few of them are available at any time. Most of them will require a simple sign up that will take just a minute or two of your time. Others will be available when you visit a store in person, and are available just for the asking. If we had a nickle for every time we’ve heard someone out there ask “Where can I get free makeup samples?”, we’d be rich. So many people have no idea where to even start. Here’s a run down of the various places that offer them. Department Stores – Getting free beauty samples in person is simple. You just need to know when and where to go. Nordstrom gives out samples every Saturday (we post reminders here on our site each week fyi). Other stores also have special promos and events on designated days where you can simply score on some high end beauty necessities without spending a dime. Each offer will come and go, so you’ll need to be clued into the latest info on when and where to be. Subscribe to get our free updates and we’ll let you know how to be in the right place at the right time. Facebook Pages – Nowadays, lots of companies are giving out samples and promoting them via their Facebook page. The only problem here, is the fact that it can be near impossible to keep track of when and where they are available. If you follow us on Facebook, we’ll keep you updated so you don’t have to run around checking pages like a chicken with it’s head cut off. Manufacturer/Brand Websites – Most beauty companies run some type of freebie promo at some time or another. You can check your favorite brand’s websites from time to time for the latest samples, but you have a pretty good chance of missing them since they tend to go very quickly once posted. Our site scours the web for you and posts the latest free beauty samples each day, to save you the hassle of doing it yourself. Department Store/Drugstore Websites – Like the manufacturer websites, drugstores and department stores also offer free samples. They are more likely to run promos on a regular basis, so checking these sites is more likely to result in the discovery of some type of free makeup sample. However, as we mentioned above, who has time to check each and every drugstore website out there? Not you, that’s for sure. You’ve got better things to do, right? Well, again, you’ll definitely want to take advantage of getting getting alerts via email, Twitter, Google+ or Facebook. 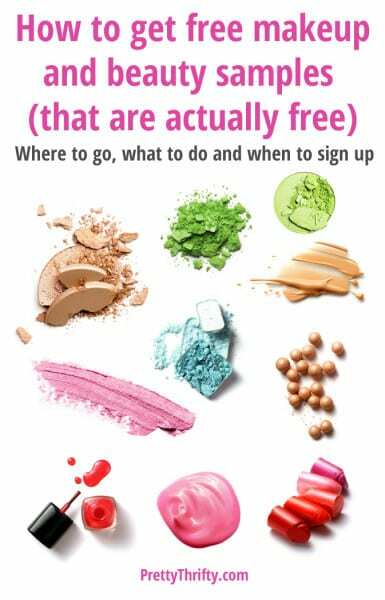 Free Sample Websites – Unlike our site, the vast majority of “free makeup sample” sites don’t actually post any legit free makeup offers listed on their site. We’ve come across dozens of sites that have a nice long article talking about the benefits of free makeup samples or something equally unhelpful. I mean, we already know about the benefits of free samples (they’re free, duh), or we wouldn’t be looking for them. Most of these other sites don’t actually offer a visitor anything of value. Someone searching for “free makeup samples” obviously wants to find actual free product offers, not junk offers or some redundant article on why samples are so great. In contrast, a legit site like ours can be your best friend. We do all the research for you and list the best samples in one convenient place. 1. Never, I repeat, never give out your credit card info. Yes, some sample offers may require you to pay shipping. But that’s why we recommend sticking to signing up only for free makeup samples with free shipping. Paying for shipping for a free sample is pretty pointless anyway, in my opinion. You might as well just go buy the product at that point. If you make it a rule to never give out your financial info when requesting samples, you won’t have to ever worry about any extra or hidden charges. 2. Check to see if participation is required. Some offers come with no strings attached. Others may require you to participate in a survey, questionnaire, or to review another product or two. Although these offers aren’t terrible, they do take more time than the free samples without surveys, so just keep that in mind. If people don’t know the requirements ahead of time, they can end up feeling frustrated with the amount of time it takes. If any offers on our site require participation, we make that clear so that you can tell them apart, and we’ve listed our “quickest-sign-up” samples here for those of you who only want simple sign ups that don’t require surveys or participation. We scour the web to find legitimate, 100% free samples for our readers. We post them daily – as separate posts on our freebies page. If you see one you like, click on the title of the freebie (the bolded pink text) to read the full post. Each sample offer is posted with detailed instructions on how to get it and where to go to sign up. We include instructions, links and whatever information you need for that particular beauty freebie in our post. If you have a question on ANY freebie offer, leave a comment on that post and we’ll get your question answered ASAP! We also have a FREE daily freebie newsletter that you can sign up for too! We’ll send you one email each day containing all the latest freebies, deals and other site updates so that you can keep up-to-date on what freebies are live. You can also get live updates by following us on Twitter, Facebook, Google+, Pinterest, Networked Blogs or Bloglovin’. Each freebie will be posted in real time so you won’t miss a step. This is a great idea for those offers that are time sensitive – yes, some offers run out in hours or even minutes! Am so glad I found your site. I love free goodies! I have gotten department store samples before, and samples online with Sephora purchases. But there’s so much more out there! Yay! And thank you. I have gotten lotions and toothpaste samples (and grateful for them), but never make-up samples. The offers are always expired. I check at least 3 times a week. What am I doing wrong? 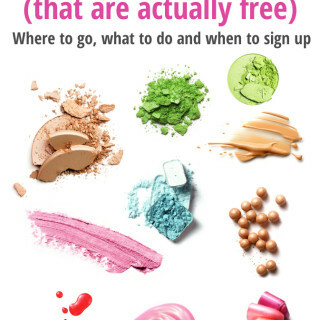 Interesting… I never even thought about checking for free makeup samples! I have really pale skin and it’s hard to find a foundation tone that matches my skin, since I prefer mineral makeup and generally mail-order it. I’ll check into the samples – I have several foundations that I can’t use because they just ended up too dark a color, even when I order the lightest shade available. Great tips!! My daughters love free make up samples so they can try different colors. I also love that your links are a bold color – good idea! Have you ever gotten one of those where you supposedly just had to answer a few questions and you would get the sample, and then discover the questionnaire required you to get more offers, and then it never ended, and was pages and pages, and then finally when you were done they said you didn’t fill it out correctly and weren’t going to give you whatever it was. Ugh. It is easy to run into negative situations online. Before you know it, you are being asked really personal information in the form of a survey. Ughh! Nice to see you helping people find honest places to try products. Nice post. I’m sure ladies would love this. I’m so glad I took the time to read through this. I have had some rather annoying experiences with “free samples”, so I’m am so grateful to have found your site. I’ll be following you! Thanks again for taking time to put all of this together. You are very welcome Joann! We are so glad you found us and we hope we can help you find tons of great freebies. 🙂 Thank you so much for your comment! You’re welcome! Hope you found them helpful!! Great advice, especially about never giving your credit card number out or paying for shipping. Free should be FREE, and these companies ought to be grateful people are interested in their products. Trial sizes often get me hooked, and I end up being a loyal customer. Thanks for the great tips. My fiance has been couponing since the beginning of the year and she has managed to get a huge amount of cosmetics and cleaning stuff like shampoo, conditioner, face towelettes, toothpaste, soap, deodorant and other things for free or for a ridiculously low price. We have about 15 tubes of toothpaste alone and they aren’t the travel/sample sizes either. These are some great tips. Thank you so much for sharing them with us. You can always get free samples from your local avon lady too. I used to have tons of samples on hand. I love free samples! I had no clue there was a way to still get them. I used to spend hours on the computer in the 90’s filling out my info. to receive all kinds of free samples. It was such a hobby of mine at age 10-15!! I am so glad I found your blog/website!!! I have been on here litterally all day looking! I absolutely love it! Your site is simple and easy and the free products are REALLY free! You don’t have to “travel across the country” to get free products! simple and easy! Thank you so much! I am definitely hooked! I absolutely need this information! I have filled out so many forms to supposedly get samples of lots of things, and then never get them. I have even answered personal medical information, answering no to having diabetes 2. The folliwing day someone called me saying I filled out form requesting to order diabetic supplies. I let them know they were wrong and to never call me again. Thanks for having a legitimate form for your readers to actually get samples. Is this available in Canada? I am single with 2 kids it’s a blessing to have someone do the leg _work for u. And THIS post is why I love your site! Thank you for doing all the legwork! I very much appreciate it! You are very welcome! We hope you can get some great freebies!